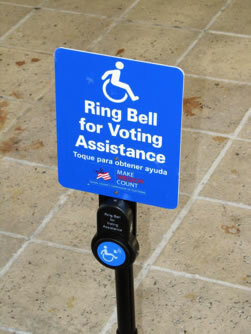 "Ring bell for Voting Assistance" A sign and doorbell placed outside of a polling place provides an accommodation to an inaccessible polling place. In November, 2000, U.S. elections had a wake-up call when a confusing ballot design arguably affected the outcome of a presidential election. In all the commotion, it was easy to miss the fact that the design flaw in the ballot – the infamous "butterfly" design – was caused by an attempt to make the ballots more accessible. The election official in charge of that ballot was quoted as saying that she was just trying to make to make it easier for the many older adults in West Palm Beach County to read the ballot by increasing the size of the text. Unfortunately, the larger text pushed the list of candidates to two sides of the punch-card, making the ballot less usable. This story is worth remembering because so many attempts to make elections accessible have followed a similar pattern: good intentions leading to incomplete or inadequate solutions that may be nominally accessible, but are not also usable. A separate section of the law also provides funds to improve the accessibility of polling places (HAVA Section 101(b)(1)(G)). After ten years and two national elections after HAVA, this article will look at how well is has worked. Are elections – polling places and voting systems – now accessible? One measure of success in making elections more accessible is whether more people with disabilities – both in absolute numbers and in comparison to people without disabilities – are participating in elections. This is a complex question, as the choice to participate is a function of many factors, including educational level, income, and the overall political climate. According to a 2010 survey by the Kessler Foundation and the National Organization on Disability, conducted by the Harris Poll, in the twenty years since 1992, the gap in election participation between people with and without disabilities closed in the 2008 elections. They credit a wide list of factors, including the HAVA mandates, improvements in voting system accessibility, and wider availability of convenience voting. (Kessler/NOD & Harris, 2009 p. 131). Two reports from projects funded by the Election Assistance Commission show that a gap still exists. Schur and Adya’s (2012) analysis of Community Population Survey (CPS) data concludes that "Fully closing the disability gap would have led to 3.0 million more voters in 2008 and 3.2 million more voters in 2010." The experience at the polls reported in Defining the Barriers to Political Participation (Hall and Alvarez, 2012), an analysis of the data in the 2008 and 2010 CPS, a national 2008 Survey of the Performance of American Elections, and focus groups about the election experience, shows the same convergence towards national averages, but also reports people with disabilities lagging by a few percentage points in registration and voting. The highest percentage of voting participation is by individuals with some form of hearing disability. They voted at higher rates than the average of all voters with disabilities, and just 1.4% (63.1% to 64.5%) less than voters reporting no disability (p31). At the polls, individuals with disabilities were more likely to say they had a variety of problems, from problems with the equipment to needing help voting (p11). It’s easy to forget the importance of polling places as potential barriers to voting. The number of polling places in a jurisdiction ranges from small and rural towns with just a one to large urban districts like Los Angeles County, with over 4500. Polling places are spaces used only temporarily for elections, so they can have a range of accessibility challenges, from stairs or doors without automatic openers to lack of accessible parking spaces or access from public transportation. They are also unfamiliar spaces, often not part of a daily routine. For example, a polling place in a school might have a fully accessible entrance only through parts of the school building in use for students and not available for use by voters. A report by the US Government Accountability Office (2009) estimated that in 2008, although the number of accessible polling places had increased (up to 27% from 16% in 2000), 27.4% still had "potential impediments and did not offer curbside voting." 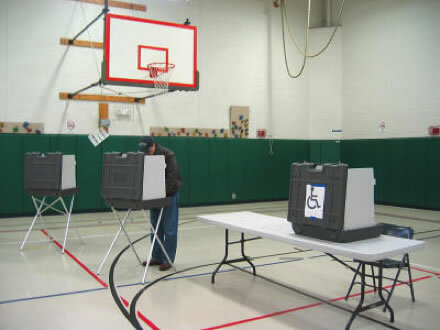 Accessibility of polling places continues to be a contentious area for advocacy, for example, in New York City where "a federal judge ruled that the [New York City] Board of Elections was in violation of the Americans with Disabilities Act for not providing meaningful access to polling places" (Taylor, 2012). "Even with this very positive report card of the voting experience, some clear areas for improvement still exist, considering that one in ten who voted at the polls said an accessible voting machine was not available for them, and nearly one in five who did attempt to use an accessible voting machine said poll workers had problems setting up or activating the machine (especially activating the audio ballot, which was the way in which a great majority chose to use the machine)." Several reports suggest that mobility problems especially getting to polling places are a factor in low turnout (Schur & Adya, 2012, McGrew, 2012, Hall & Alvarez, 2012). One trend in elections since 2000 is an increase ways of voting collectively known as convenience voting. This includes absentee voting (usually using a paper ballot mailed to the voter and returned to the election department by mail), early voting for a period of several days to two weeks before Election Day, voting centers which allow voters from several election districts to all use a centralized location, and online ballot delivery systems (discussed below). The availability of convenience voting methods is not uniform across the states, but almost all are experimenting with some forms. In addition, in a survey of state election departments, thirty reported providing "supervised voting in group-living facilities, such as hospitals, assisted living centers, and nursing homes." (ITIF, 2012) The State of Oregon has a widely-publicized program that uses iPads to help people with disabilities who cannot used the standard paper ballot, and cannot come to a voting center. In its first use (a special primary election in five counties), 89 people voted using this system (Seelye, 2011). A final form of convenience voting is mandated by the 2009 Military and Overseas Voter Empowerment (MOVE) Act, which expanded election protection for overseas citizens and service members and their families, making it easier for them vote. Because of the time required to mail ballots to and from other countries, a growing number of states have also implemented programs to allow overseas voters (known as UOCAVA voters for the 1986 Uniformed and Overseas Citizens Absentee Voting Act) to receive blank ballots online and sometimes to mark them electronically before printing and returning them by mail. Importantly for voters with disabilities, MOVE requires that states make voter registration and absentee ballot applications available electronically, along with general election information. These provisions for UOCAVA voters would also benefit people with many different disabilities, by allowing them to manage their election participation in their own time and using their own technology. An important risk of online support for voters, however, is the need to ensure that the information is accessible. In a survey conducted as part of the Military Heroes Project (examining election administration and technology support for wounded veterans), only 44% of the states reported having a webpage specifically for voters with disabilities (ITIF, 2012b). This survey, however, did not include local county election websites (that is, the most direct source of information about local elections), so we do not know how many voters have good access to elections information in their own district. Another risk is the "digital divide" – the difference between voters who use technology like web browsers and smartphones in their daily life, and those who do not. A study at Rice University (Campbell et al., 2011) with non-disabled voters concluded that although there is a lot of interest in devices like smartphones as a way to increase turnout, whether someone is already an owner and user of such a device has an "important influence on voting systems error rates" (p4): non-owners made substantially more errors voting on the device. One of the requirements of HAVA was to direct the Election Assistance Commission to create standards for voting systems. The first version of the Voluntary Voting System Guidelines (VVSG)(EAC, 2005) was adopted in 2005. VVSG 2005, as it is known, includes a substantial chapter covering usability and accessibility. All systems certified to the VVSG 2005 standards must pass the usability requirements; systems designated as "accessible voting systems" must pass both the usability and all of the accessibility requirements. Although the standards are called voluntary, this reflects the political divisions between Federal and State governments. All states are bound by the requirement to provide at least one accessible voting system in each polling place. Most of the states also require that voting systems be certified to the VVSG to qualify for use in their state. In 2002, HAVA included an implicit assumption that the new voting systems the Act funded would be electronic, allowing a broad range of assistive technology. The work on new voting system standards focused exclusively on computer interfaces, only introducing requirements for "non-editable" (that is, paper) ballots in an updated version, introduced in 2007 and still under review. Between 2000 and 2012, the country made two U-turns. Many states purchased all-electronic systems, known as Direct Recording Electronic systems or DREs. These systems present candidates and ballot questions on-screen, and record the answers electronically. They are typically touch-screens, are augmented with audio and tactile controls for accessibility, but some systems have tactile controls (including the widely-used Hart eSlate). Although fully electronic systems are generally better for accessibility, two problems became apparent. In a review of currently certified systems for the ITIF Accessible Voting Technology Initiative, the University of Washington Center for Technology and Disability Studies (Cook & Harniss, 2012) found a wide range of approaches to meeting the VVSG requirements for accessibility. Tactile keypads, for example, ranged from highly usable to very difficult to discern. Audio quality varied a great deal. Navigation was sometimes tedious or confusing. Few of these problems represent outright barriers to voting, but taken as a whole, they present a picture of poorly designed access features – nominally meeting requirements, but not creating a very good experience for voters with disabilities. First, the usability of the accessible voting systems was poor, both for voters and for poll workers. In 2007, the California Secretary of State ordered a "top-to-bottom" review of voting systems. Noel Runyan and Jim Tobias evaluated three voting systems in use in the state(Diebold AccuVote TSx, Hart eSlate and Sequoia Edge I and II), using both heuristic review and usability testing. They concluded that, "Although each of the tested voting systems included some accessibility accommodations, none met the accessibility requirements of current law and none performed satisfactorily in test voting by persons with a range of disabilities and alternate language needs." (Runyan & Tobias, 2007, p1). The problems they identified included the physical set up of the systems which interfered with use from a wheelchair, the physical effort required to use the tactile (non-touch) controls, poor audio presentation, and the long times needed to use the accessibility features (3 or 4 times longer than the touch interface). Second, election security advocates raised concerns that it is not possible to meaningfully recount or audit a voting system that does not produce a permanent (non-electronic) record that can be verified by the voter – paper ballots or a voter-verified paper audit trail. In 2012, 67% of the United States will use a combination of voter-marked paper ballots with either a DRE or an electronic ballot marking system provided for voters with disabilities. (VerifiedVoting.org). The accessible voting system is also often used to provide access to alternate languages mandated by the Voting Rights Act. The most popular accessible voting system is the Election Systems & Software AutoMark. According to the Verified Voting database, 1,421 jurisdictions (of just over 3,000 in the country) use this system. This return to paper ballots places accessibility and security advocates in opposition. However easy it may seem to dismiss the need for a paper trail, there have been several elections with unresolved questions about how voters marked their ballots. In many cases, the number of votes in question was too small to change the outcome of the election. But not in all. For example, in 2006, over 14,000 voters in Florida’s 13th Congressional District failed to cast any vote at all in a close, highly contest election, decided by a mere 369 votes. Experts believe that the ballot design was part of the problem, with a residual vote rate of 13.9% in Sarasota County, compared to 2.5% in neighboring Charlotte County (Norden, et al., 2008, 2012). In the following election, Sarasota switched to a paper ballot system. A challenge in the next few years is that some of the systems purchased with HAVA funds are aging, and will need to be updated or replaced soon. Since 2000, there has been a consolidation in the elections industry. Where there were once four major vendors, there are now just Elections System and Software (ES&S) and Dominion, along with smaller companies like Hart, Konnech, and Unisyn. Both Dominion and ES&S have recently introduced new systems that integrate an accessible system into a paper ballot scanner, allowing it to also function as a ballot marking device. Neither of these systems are yet in use in any great numbers, however. Several companies now have online ballot delivery systems, including Democracy Life, Everyone Counts, Scytl, and Konnech. Some started as a way to distribute sample ballots; others were developed to meet the requirements of the MOVE Act. 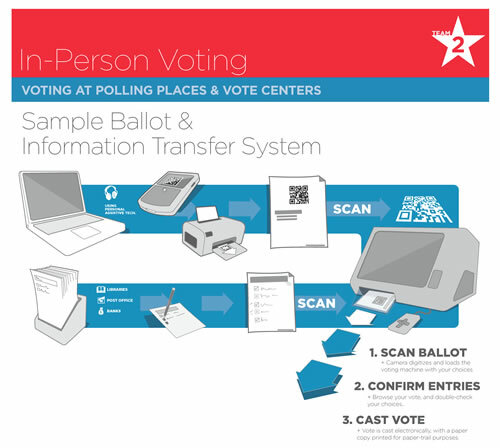 Typically, these systems offers users alternative ways to mark and return their ballot. They can print a copy of the ballot and mark it on paper, or use an interactive interface to mark the ballot and then print it. In both cases, the standard way to return the ballot is by postal mail. Although some jurisdictions accept faxed or even emailed ballots, both of these methods mean that the ballot is no longer secret. A challenge with these ballots is that they are not standard and the ballot scanners cannot read them. Election officials copy the information ("remake the ballot" in election jargon) onto an official ballot. This creates opportunities for errors or misinterpreting the way the voter marked the ballots. Some electronically marked ballots include a bar-code allowing them to be remade automatically, with fewer errors. But, either way, it is an extra step with privacy and security implications. On the positive side, ballot delivery systems can also integrate information about the election and candidates into the ballot. Voters can read about the candidates and official explanations of ballot questions while they are making their choices, creating a richer voting experience. From advocates to election officials, few are satisfied with the current state of elections technology in general and accessible systems in particular. Two jurisdictions, Travis County, Texas and Los Angeles County, California have launched projects to come up with a better way to run elections and make them both accessible to all voters and administratively sound. In addition, the EAC funded two large multi-year research projects, the Research Alliance for Accessible Voting (RAAV) and the Accessible Voting Technology Initiative (AVTI). The AVTI ran two projects aimed at spurring innovative ideas for accessible elections. Several of the concepts from these projects have been incorporated into funded AVTI research projects. The Accessible Election Design Workshops brought together election officials, voting system designers, industrial and interaction designers, disability and policy advocates, and people with disabilities to create new concepts based on the principles of universal design for voting remotely or in person, learning about elections, and ballot design. (AVTI, 2012, Rebola et al., 2012). In addition to the concepts these workshops created, they were an opportunity for participants to work together in a structured way to solve difficult problems. OpenIDEO, working with AVTI, hosted an online design challenge: How might we design an accessible election experience for everyone? Over 700 people, some being introduced to accessibility for the first time, participated in designing and refining new concepts for accessible elections and eventually selecting 11 winning concepts. On the surface, the promise of HAVA has been kept. Election officials around the country have purchased accessible voting systems and made them available in every polling place. Officials continue to work to create programs to support voters with disabilities. But the work is not over yet. The current voting systems are far from ideal, and still do not work well for everyone. An example of a concept from the accessible voting technology workshops. This concept explored how paper and electronic ballots could be cast and counted on the same voting system. (A full description of this concept is available on the ITIF site. Quesenbery, W. (2013). Accessible Voting in 2012. Information Technology and Disabilities E-Journal, 13(1).